This week: Sooo much! Another interview, a break-postponement and more amazing fan art! If you’re a fan of webcomics, you may have run across the talented pros over at Webcomic Alliance, a blog and podcast loaded with resources for both webcomic creators and fans. I’m honored to say this month Untold Tales of Bigfoot has been chosen as WA’s Pick Of The Month! Stop by their site to see a write-up on UTOB and read yet another interview with me. Here’s a slight change in plans that will please you to no end: I told you just last week that Bigfoot would be on a 2-week holiday break while I caught up on a mountain of work. But I spoke to a friend and fan of the comic last night who was aghast that I’d even consider pausing the story for that short break. During our conversation, I didn’t go into detail about the other projects and paid assignments that need my attention, or how the demands of the holiday season can drain precious time and energy from the most enthusiastic comic artist. I didn’t even remind him that Untold Tales of Bigfoot is delivered every week, like clockwork, for absolutely no fee to the reader nor income to its creator for things like food and shelter and so, at times, must be put aside for paying gigs. I didn’t tell him any of that. So it looks like that’s what’s happening. I’m going to push to get enough done so that the comic will continue, unbroken, for some time to come. But I’ll toss out this friendly warning: No matter how much I love working on Bigfoot, one day in the far flung future (perhaps sooner) life, work, or my own human frailty may impinge on this pleasant little webcomic and, for the sake of rent, relationships or my own sanity, I may need to take a short break. It won’t be because I’m lazy, or because I’ve lost interest, or because I want to ruin your wednesday morning. If I ever do take a short break from the comic it will simply be because sometimes the piper must be paid. If and when that day arrives, I hope you’ll all understand. Finally, it’s time for more terrific fan art. This time, I exchanged far art with Sean McLean, creator of Underwhelmed and Loop. Yeah. Two webcomics. And here I am whining about taking a break. 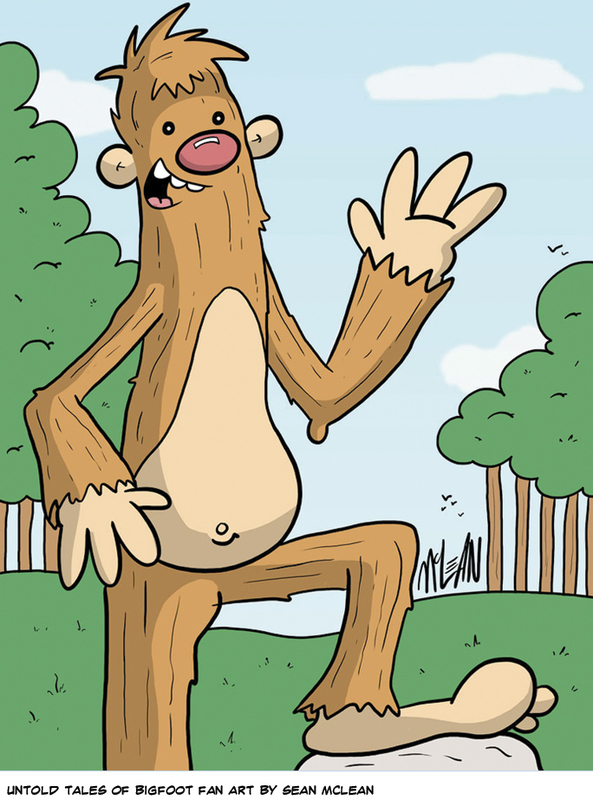 Anyway, if you like the way Sean handled Bigfoot’s friendly hello (below) as much as I do, you should check out his comics. His newest project, Loop, tells the tale of a time traveller from the distant future stuck in the distant past with only a caveman as his guide. And while you’re there, you can see my take on Sean’s characters. Your fans hereby authorize you to take a break when needed. : ) Merry Christmas. Whew! Thanks, Beth. There’s a big shift in the story coming up in a few months. That seems like a good time for a very short break. Give people a chance to process the story up to that point and then WHAM! hit ’em with the new stuff after a short break. I hope you have a very Merry Christmas as well! Oh good! Now Scout knows Bigfoot’s name! Now if only Bigfoot could learn Scout’s name! Well now that Scout has figured out who his friend is and what he’s named for let’s remind Scout of his name and it’s meaning. It means a person set out ahead, so Scout no more of this talking about getting back…for your name sake alone. 🙂 I can’t wait to see what lies ahead. It has become norm for webcomickers to take breaks and their loyal fans are right there waiting for them when they return, your eventual break will be no different. I have noticed also a lot of webcomics starting to transition into seasons like TV shows. They will run for 4 months or so steady, take a month or two off, then come back with another 4 month steady run. This gives the creator time to decompress, tackle the paying gigs more feverishly, and to build up a good buffer allowing them time with family and friends more, opening up their schedule long term for when it’s another active season. It does seem, at times, that Scout’s family might have misnamed him. Love the use of the smaller font for bigfoot. Great work, Vince! Love the totem, and your way with the Great Outdoors. As for your schedule, well, a guy’s gotta do what a guy’s gotta do. I understand totally what you’re going through, it is a real challenge to balance work and a life (life? riiight). Good luck with that!